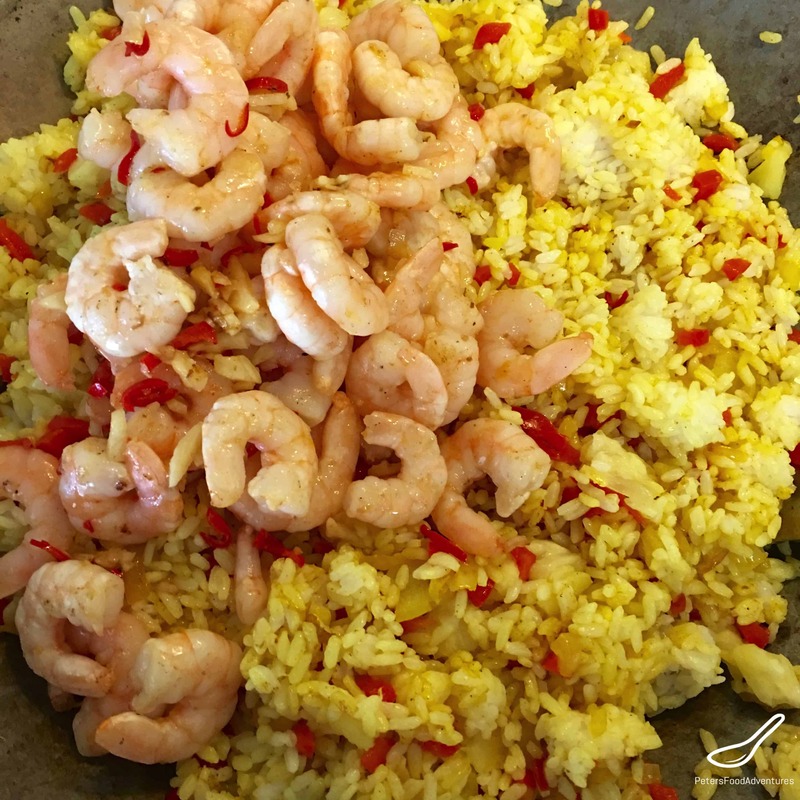 I first tried Thai Pineapple Fried Rice on a trip to Malaysia and I was hooked. It’s a popular dish in Malaysia, which is directly beside Thailand, and has variations across South East Asia. I especially love adding Sweet Chili Sauce to spice up the dish. Everyone loves eating Fried Rice, it’s a great way to use up leftover rice. I never seem to judge how much rice to cook, and always have too much rice leftover. This recipe is perfect for me, allowing me to use up leftover rice. Not everyone knows how to make Pineapple Fried Rice properly. It’s definitely not regular Chinese Fried Rice with pineapple thrown in. It’s also not Hawaiian Fried Rice. I wonder if some of those Thai Pineapple Fried Rice recipe writers have even been to Malaysia or Thailand? The flavor combination from Chinese and Thai flavours are completely different. I’ll let you be the judge of some of the recipes out there! We eat this dish in Malaysia all the time, and there are variations in making this dish. Pork floss is a type of dried meat with a cotton candy texture, used to garnish and flavour the fried rice. The pork floss or rousong in chinese, can be substituted for beef or chicken floss called serunding in Malay. Some people prefer not to use it at all, as it is quite expensive. 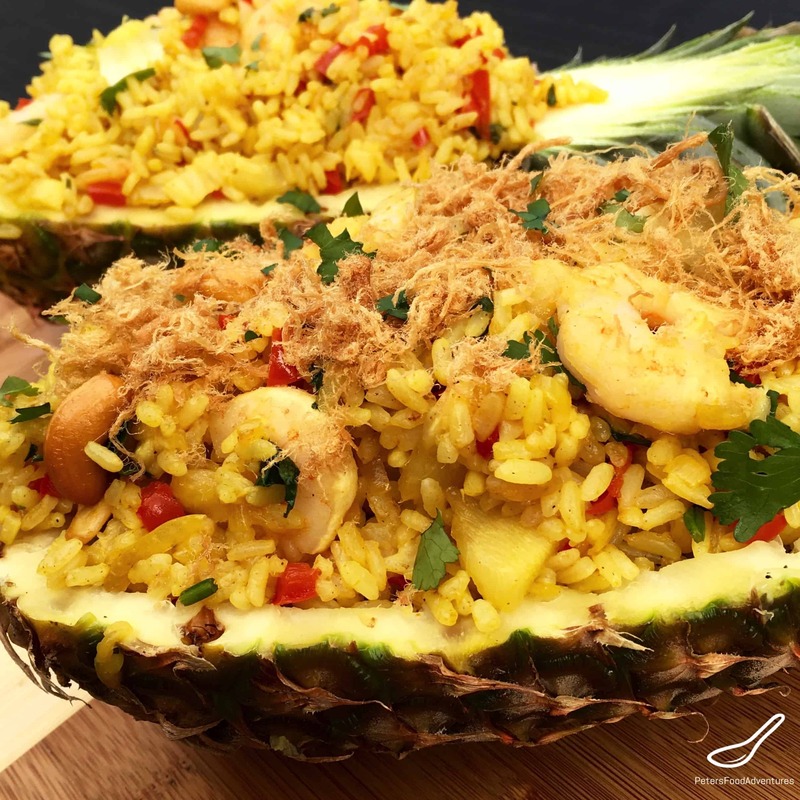 The other tip I have is to balance the sweet, sour and salty flavours of the Thai Pineapple Fried Rice. It’s important to get a sweet and flavourful pineapple, I can’t stress this enough. If the pineapple isn’t sweet enough, it throws the flavour balance off and won’t taste right. Add a tablespoon of sugar and adjust to taste. It’s always fun to serve the Malaysian or Thai Pineapple Fried Rice in a hollowed pineapple boat, used a bowl. Adds and easy wow factor, plus the necessary pineapple your meal. Bon Appetit! Приятного аппетита! 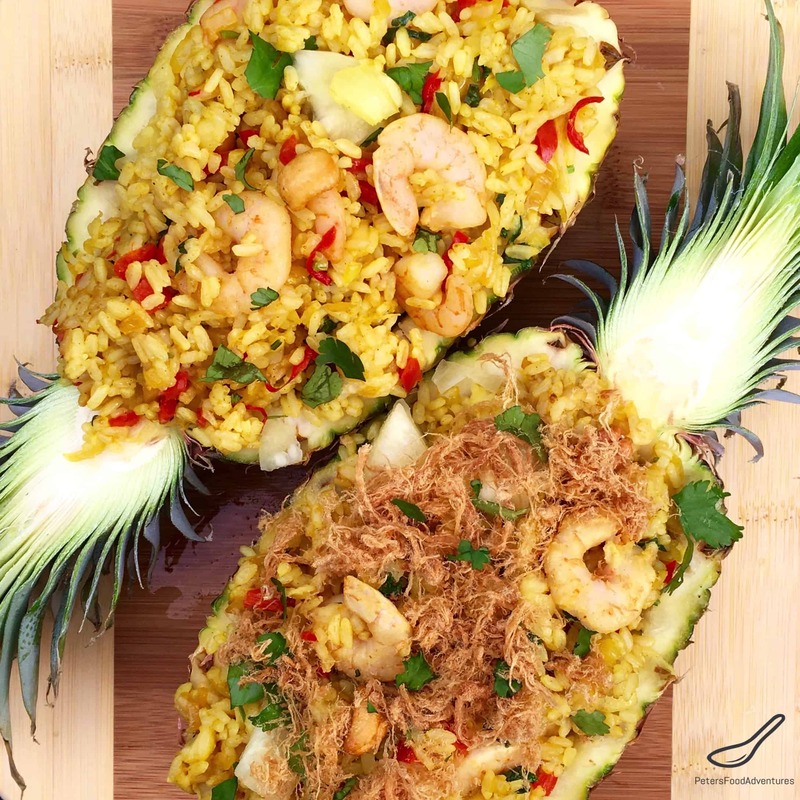 Authentic Thai Pineapple Fried Rice served inside a pineapple! Easy to make and delicious! Heat 1 tablespoon oil in wok until hot. Fry the garlic and red chili until fragrant. Add the shrimp and fry shrimp until it is cooked. Removed from heat and set aside. Don't overcook the shrimp! Add 1 tablespoon oil to wok. Fry the onion, turmeric, curry powder and red pepper and fry for about 2 minutes. Add the rice and pineapple and stir together. Then add the fish sauce, soy sauce. Stir fry for another minute. Taste and adjust if necessary. Add the cashews, cooked shrimp and cilantro. Serve in a hollowed pineapple boat, garnish with cilantro and pork floss and serve immediately. It's important to balance the sweet, sour and salty in this dish. If the pineapple isn't sweet enough, add sugar to correct the flavour. If using canned pineapple, I use a whole can and adjust sweetness as required. You can also replace the shrimp with chicken, or add chicken with the shrimp. Day old rice is best, or at least prepared and cooled a few hours in advance, otherwise freshly made rice can get soggy. I love this! I love adding pineapple in with Asian inspired dishes. Plus the hollowed out shell makes for such fun plating! Thanks Katie! I love making this, fun and delicious! 🙂 Thanks for checking it out! Thanks Rotwein! It’s definitely a delicious dish! Hope you try it and enjoy it! ???? I occasionally venture into fried rice, and this will be a good one to try. I’m trying this tonight. I’d love to know if you have a drunken noodle recipe…. Pad-Ke-Mow…. it’s a favorite of ours but I find it really hard to find a restaurant that makes this well on a consistently good basis…. Hi Liane, sorry I don’t have a drunken noodle recipe, but will keep an eye out for it! Hope you love the pineapple fried rice! ???? I used coconut oil when I tried the recipe, and I thought it really worked nicely to bring a little sweetness. Hi, I made this recipe last night for dinner with a Thai Red Curry Chicken. This rice recipe was perfection!! I did make some tweaks because I did not have the exact ingredients but the core of the recipe was still there. I have successfully made this about five times now it is that good! Thank you for this recipe.